The ElectraCOOL™ TAC60™ (Thermoelectric Air Conditioner) is a compact device for the cooling (or warming) of air in an enclosure. In the field of thermoelectric components, it's also known as an air-to-air heat exchanger. TAC60™s are particularly well suited for use with electronics enclosures, instruments and smaller control panels but have been used in a wide range of applications, such as drug compartment cooling in ambulances, and for humidors. The standard TAC60™ is designed for use indoors and has an IP20 rating, while the environmentally protected version, TAC60™-E is IP55 rated and may be used outside. The TAC60™ may be mounted in any orientation. When installed, the larger "hot-side" remains outside enclosure, and the cold side is entirely within the enclosure. The modular design of the TAC60™ allows for easy adaptation in a wide variety of applications. All units are delivered ready to be easily and quickly mounted and wired. 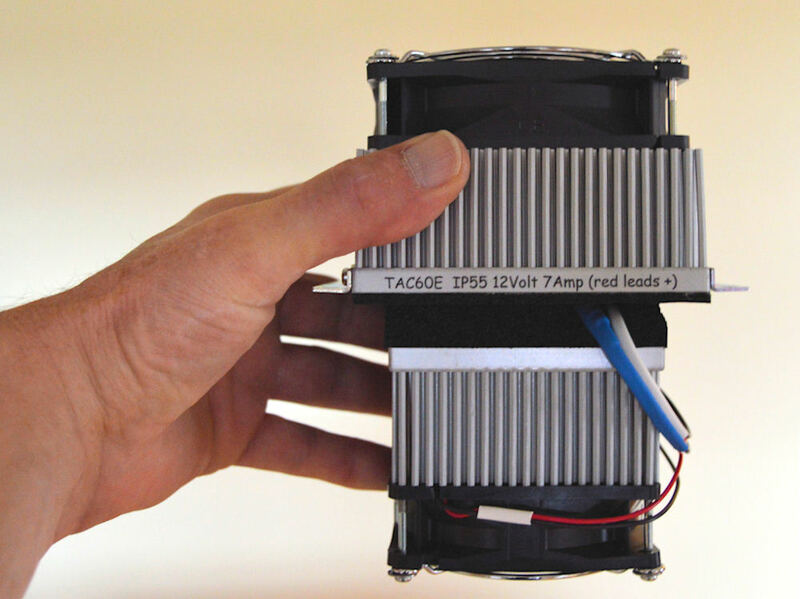 For cooling the TAC60™ uses electrical energy only (thermoelectric). 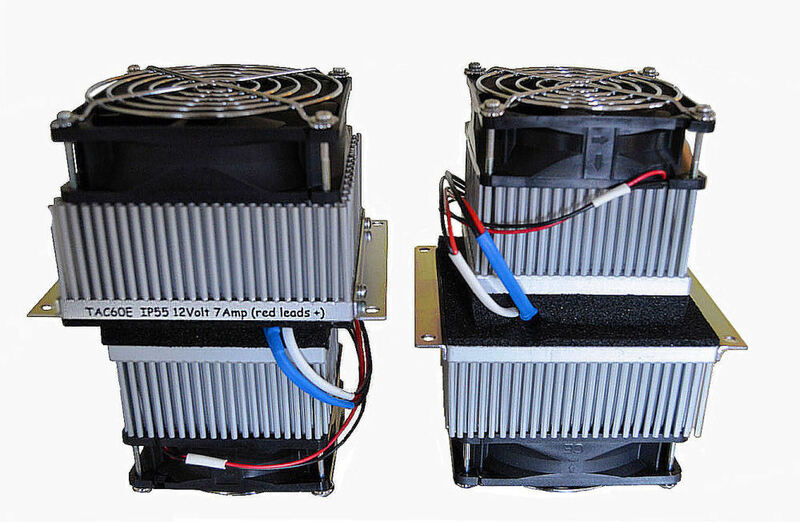 There are no moving mechanical parts (except fans) so thermoelectric air-to-air exchangers are extremely reliable and require no maintenance (except possible fan replacement). Because thermoelectric assemblies don't use any type of gas as a refrigerant they are an environmentally "Green" alternative to conventional compressor-based systems. 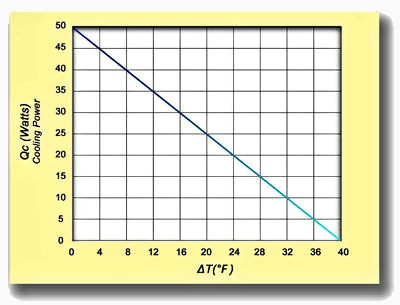 To increase cooling capacity, multiple units can be connected in series, parallel, or a combination of the two. 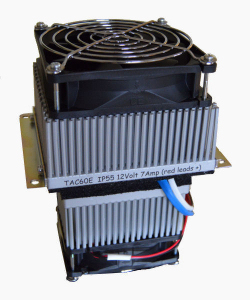 Off-the-shelf TAC60™ units are 12 VDC nominal and draw about 6.5 amps at full power. Connecting TAC60™s in series allows for use in 24VDC (2 units), 36VDC (3 units) or 48VDC (4 units) applications. Naturally, multiple strings (in parallel) allows for increased cooling capacity. "Static" construction makes ElectraCOOL™ exchangers immune to vibration so they are excellent for applications on moving platforms including ships, aircraft, vehicles like ambulances (to keep medication compartments at temperature) and robots. All models are very efficient with a high Coefficient of Performance. This means that for a given cooling capacity the electrical power absorbed (and many related technical problems) are typically reduced making ElectraCOOL™ exchangers economical to own and operate. The ElectraCOOL™ TAC60™ air conditioner was engineered to be a compact, modular unit that allows application specific scalability. Easy expansion and boundless configurations allows the TAC60™ to be deployed in applications from automation to wireless, ensuring that the electronics inside will operate reliably. The outdoor rated TAC60-E™ has an IP55 rated external fan designed for use in harsh environmental conditions. Additionally, we epoxy seal the "pass-through" opening for the fan's leads to keep moisture from entering the assembly. These conditions include the direct or indirect spray of water onto the fan, exposure to fine dust particles, morning dew that may condense inside the fan, long term exposure to salt spray and salt fog. TAC60™ (sets) can be customized and configured in a variety of ways. Power supply types often vary. We can provide enclosed, DIN rail and waterproof power supplies and make a number of custom adjustments. 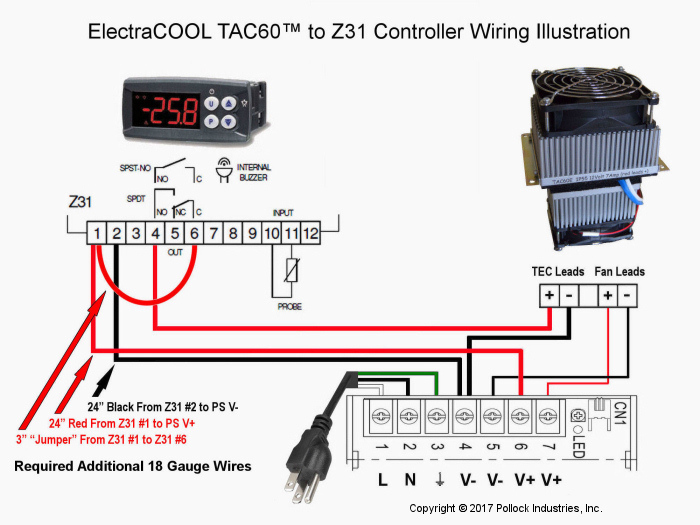 The standard TAC60™ set is great for controlling the temperature in small electronics enclosures and instruments. Also popular for humidors... The sets include one TAC60™ air conditioner, a Z31A Temperature Controller and a PS150W-12V Power Supply. When flipping the cold-side fan over, you may direct the airflow for spot cooling or deep into an enclosure. The fan shroud creates turbulence in the heatsink that keeps the airflow cold.